Earlier this year, I walked the length of the Thames path from source to barrier. There were a few places along the way that caught my attention and I vowed to return to one day – minus the hiking boots and rucksack. So, I was dead chuffed to be invited to The Fat Fox Inn in the village of Watlington, which is just a short drive from Henley-on-Thames, for dinner and an overnight stay. After exploring the local area, we checked into our room and checked out the place. This pub is very much for both drinkers and diners, with my favourite bit of the whole lot being the dining room which is ‘elegantly eclectic’. John and Katy Riddell are the owners here, and we were really pleased to hear they once lived in Cheltenham and worked at the old Whitbread brewery. With wine on order and an Aspall’s in hand, we selected the feast that would ensue. 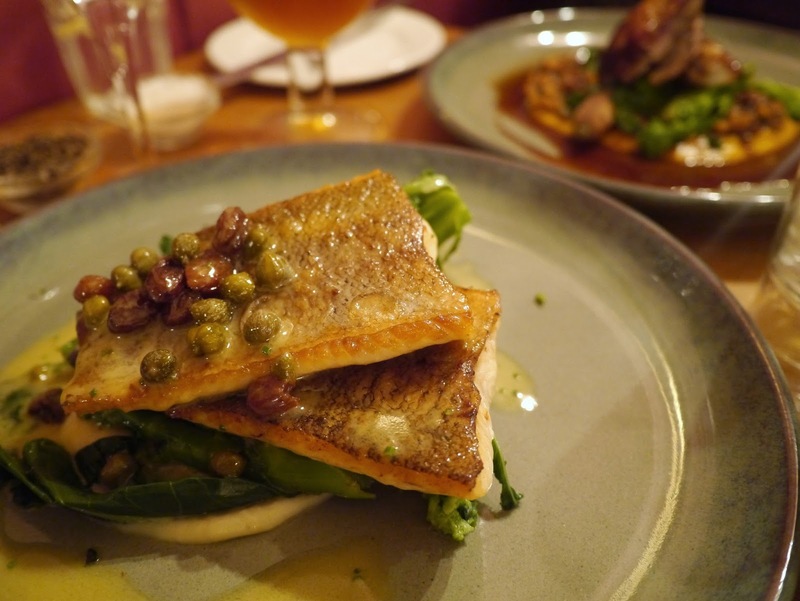 They say the menu is short, but I personally felt it boasted plenty of choice; it changes daily and uses loads of local produce, including game from South Oxfordshire. 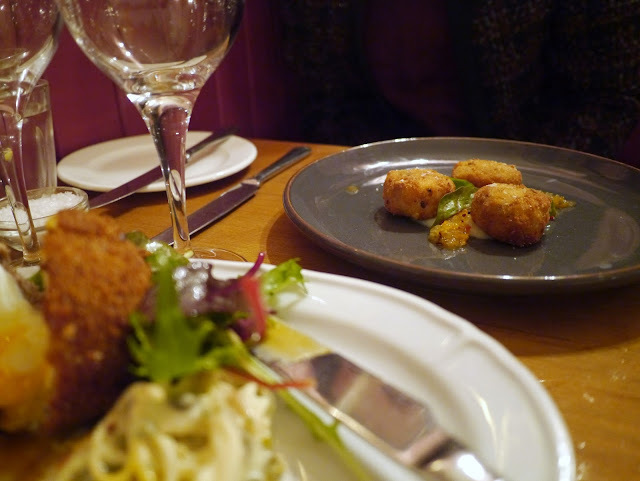 Scotch eggs are a staple here, so Kingsley ordered The Fat Fox Scotch Egg with celeriac remoulade and mustard mayonnaise for starter. It was ginormous and they nailed the whole runny egg thing. 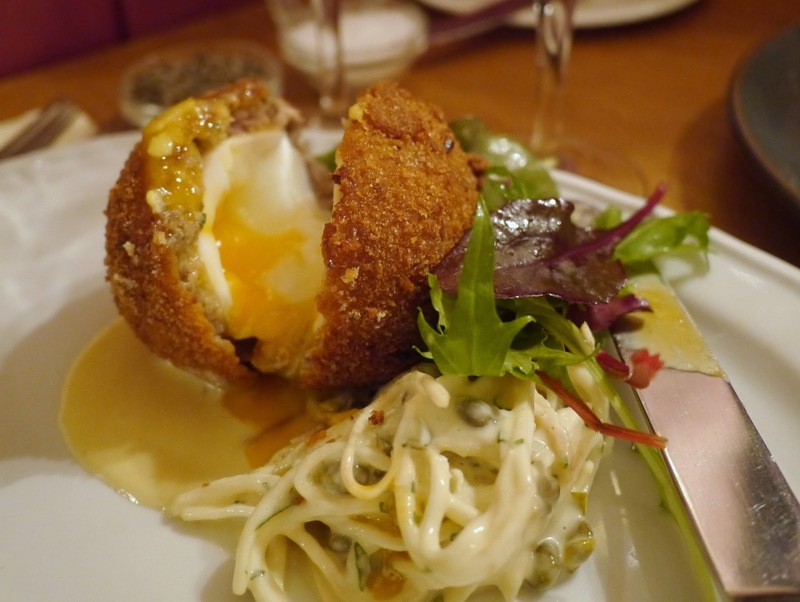 The celeriac remoulade on the side is an idea we’ll be stealing for home, we just need to perfect our Scotch eggs! 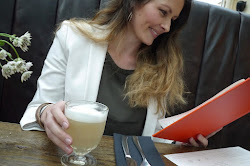 They had London Peculiar on the menu which I had to ask about as I was intrigued as to what it was. It’s a thick pea and ham soup! 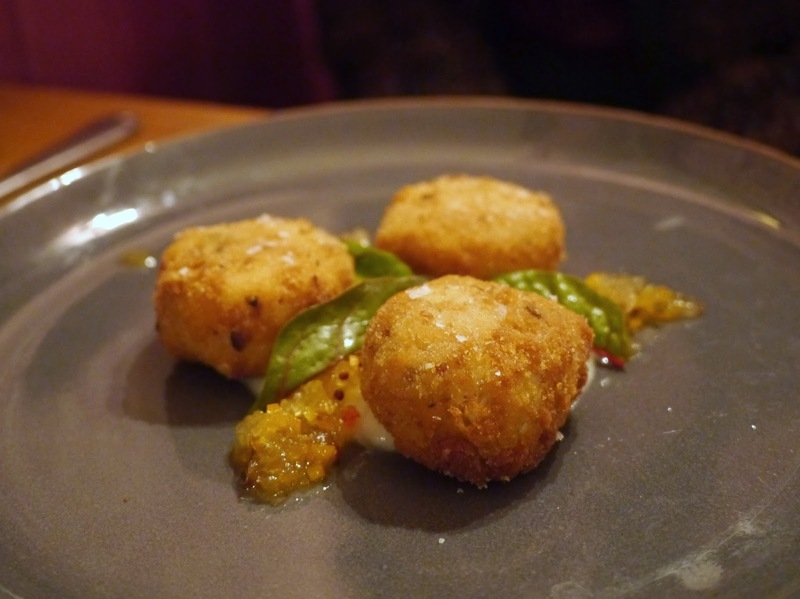 If you’ve seen my Instragram account, you’ll know we cook and eat a heck of a lot of soup throughout the winter months, so I left it on the menu and took the Chicken Croquettes instead, which were served with cauliflower puree, relish and truffle oil. The delicate flavours of the croquettes and puree were set off very well by the relish so much so that Kingsley declared me the winner of the starters. The wine arrived ready for the main course, and only because I’ve recently been wine tasting, I started messing around with checking for a meniscus, the legs, and then I took a big deep inhale and didn’t get quite what I was expecting; the wine smelt of a mouldy basement. The wine was corked which was a first for us. So I now feel like my (somewhat lacking) wine knowledge has stepped up a gear – because at least now I know what it shouldn’t smell or taste like. Our waiter whipped it away straight away and I decided to stick to the cider. 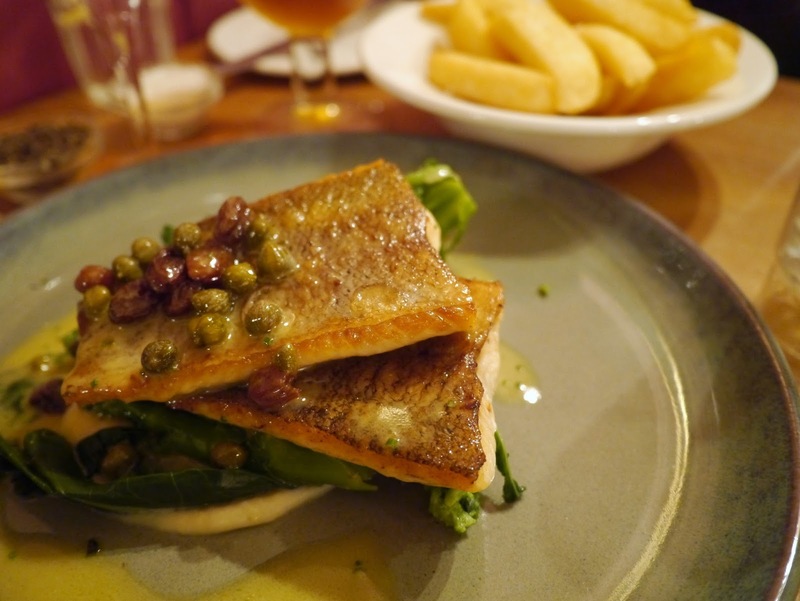 Kingsley had the Pan-fried River Trout served with a lemon, caper & raisin butter, chips and broccoli. Not just any chips mind. 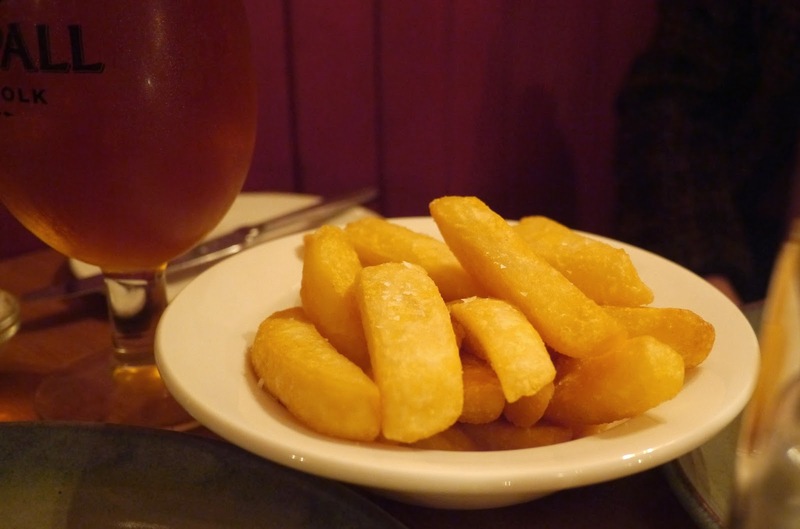 The thickest thick-cut chips you ever did see. They came as such a generous portion that he even shared with me. The skin of the trout was perfectly crisp and the sauce was deliciously creamy. Not that we didn’t want the chips (they were bloody gorgeous), but we actually felt the trout would have been better served by new potatoes; although I guess they aren’t in season at the moment and the menu is very much a seasonal one. 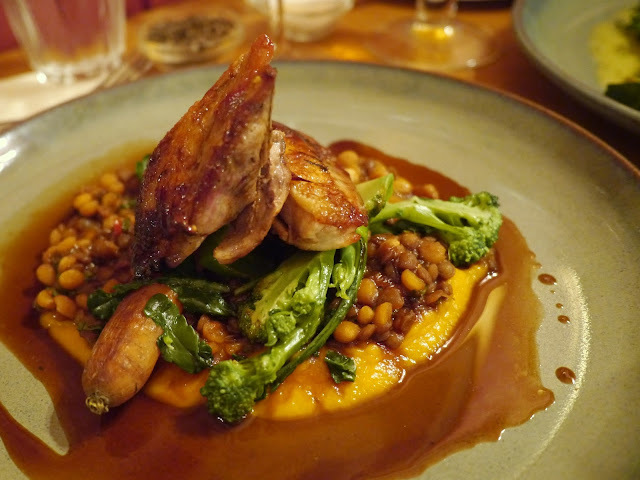 I chose extremely well indeed with Pan-roast Local Partridge Breasts with spiced lentils, coriander and butternut puree. Okay so erm, big statement ahead, but this was the tastiest plate of food I have ever had the pleasure of eating for a main course. 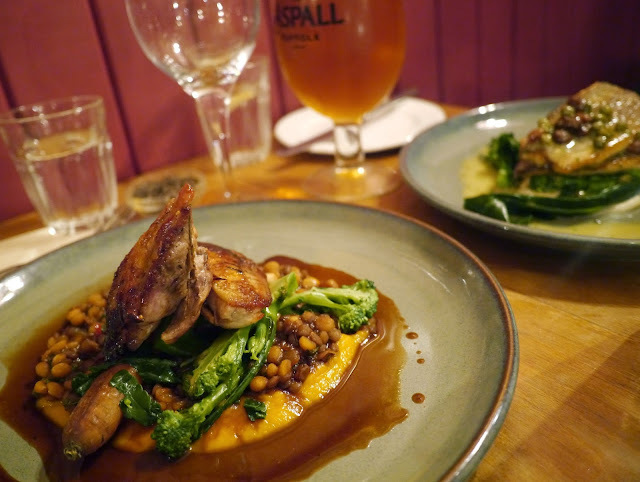 The partridge was beautifully seasoned with a crisp skin and the lentils were served al dente and spiced with what I think was fennel and a touch of cinnamon. With just a bit of gravy left on my plate and a couple of chips leftover, there was only one thing to do. Yes, I mopped my plate clean with the chips. It was like a very posh chips and gravy. It’s a good job I’m not posh because that would have been a good opportunity missed. The dessert menu was equally pleasing. 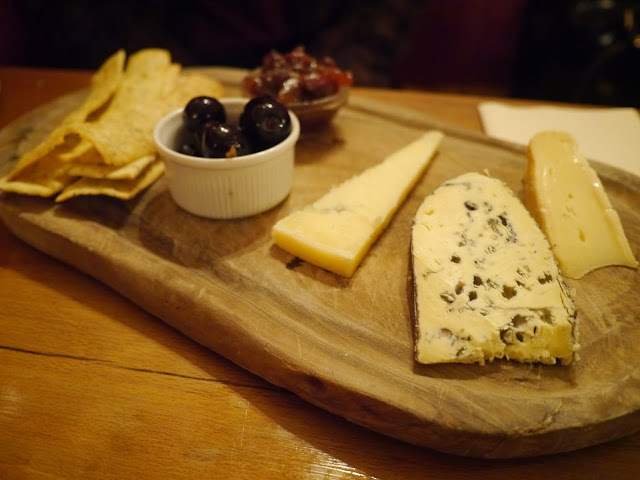 I was too full for my usual favourite of sticky toffee pud which they served with salted caramel sauce and vanilla ice cream, so I went for a selection of three cheeses: Oxford Isis, Barkham blue and Leonard Stanley. The menu describes Oxford Isis as pungent and spicy and they weren’t wrong. This cheese is ever so popular and has won awards, so don’t let my taste-buds put you off, but it’s definitely an acquired taste. 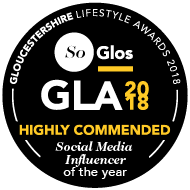 The Leonard Stanley is a local cheese made by Godsell’s here in Gloucestershire – so I’d already tried and loved it. Barkham Blue melts in the mouth but is rich at the same time. The crackers, I’m not sure if they were homemade or bought-in, but they were devoured. If they are bought-in, I’d like to know where from so they can feature on our Christmas cheeseboard. Kingsley declared he wanted something light and so ordered the Poached Pear, which was actually a Poached Pear Clafoutis, but Kingsley being Kingsley only read the first two words. 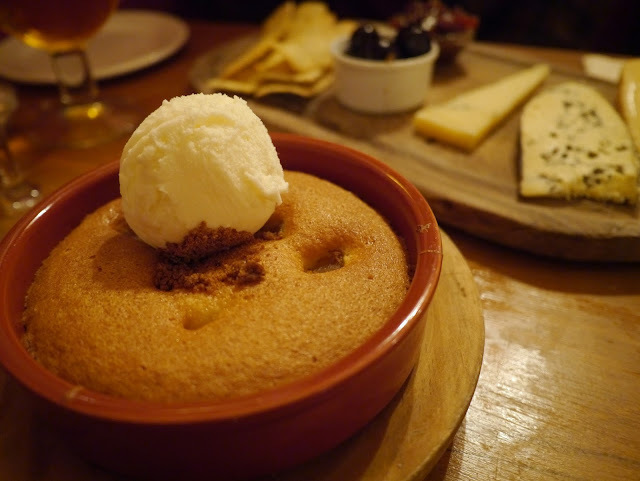 So his light dessert wasn’t so light after all, as clafoutis is a type of flan, and this one was served with milk sorbet. It’s okay though, Kingsley polished it all off and declared it a happy accident. Before we ate, having looked at the menu and knowing The Fat Fox Inn has a very friendly atmosphere, we were expecting really good pub grub. 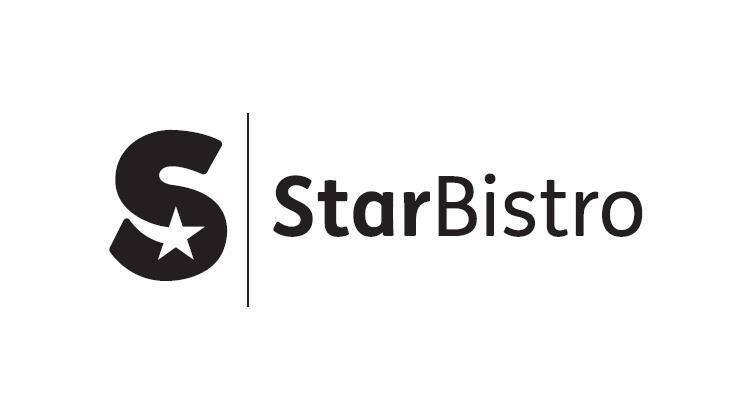 Now, don’t get me wrong, they do cater for people who want that, what with burgers, steaks and Scotch eggs on the menu, but we thought the majority of the menu went way beyond that and could be on a par with many fine dining establishments. 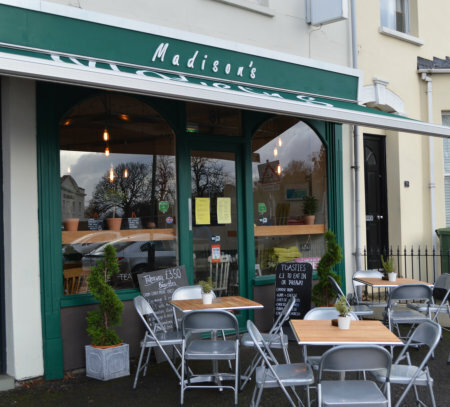 It’s just that here you get the choice of either, and all with a cosy atmosphere rather than the formalities of a fancy restaurant. Although I wasn’t there to review breakfast, I think it deserves a mention, as they served up the best full English breakfast I’ve ever had. The bacon was out of this world – streaky and cooked to a crisp. Where is your bacon from John? Send me some please! The sausage and the homemade hash brown was a hit too. So there we go, not bad huh? The tastiest main course and the best full English breakfast to date! 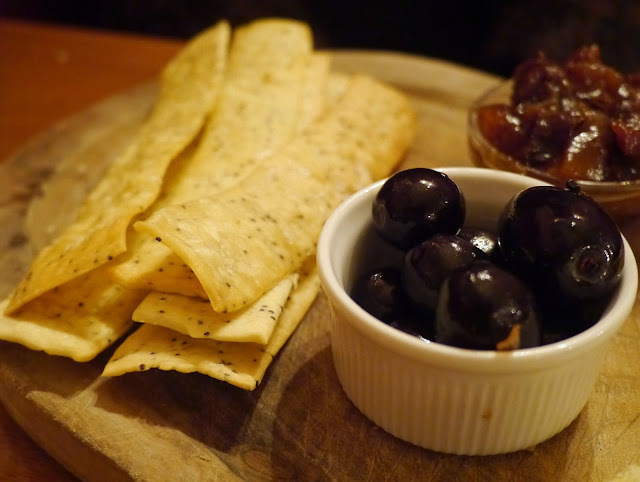 The Fat Fox Inn is definitely worthy of a visit – rucksack or no rucksack.